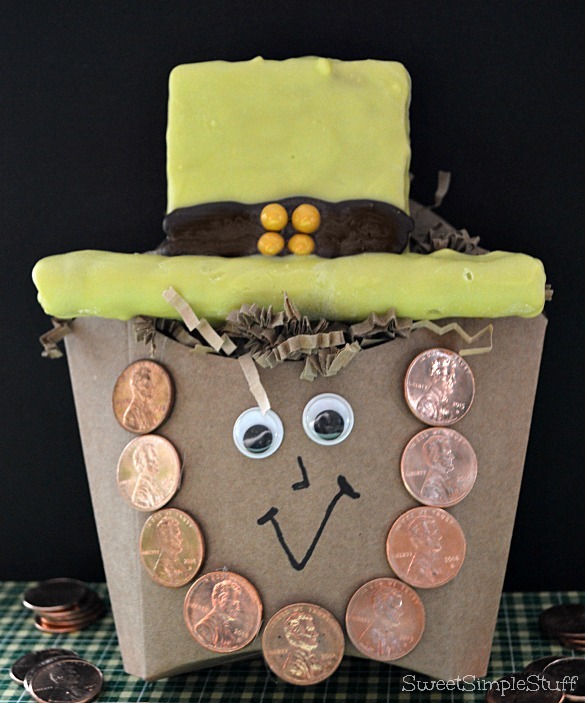 Here’s a few tips about pennies … to remove glue gun residue, put the pennies in the freezer … when the coins are freezing cold, glue should pop off easily. 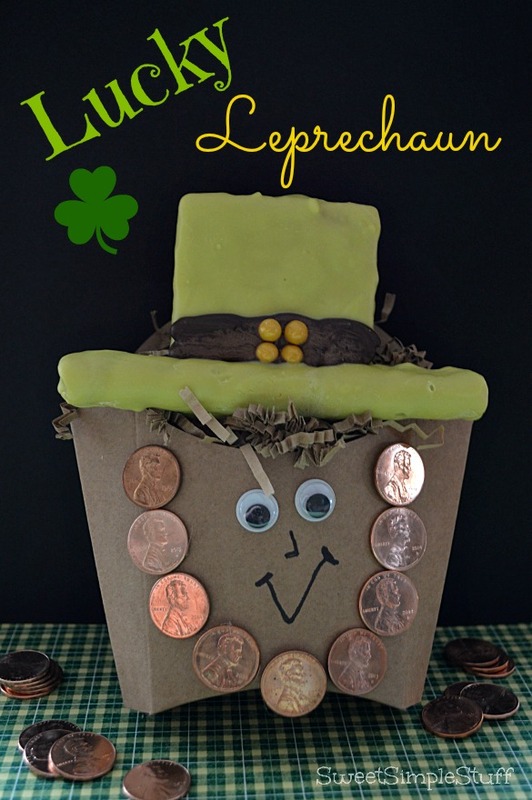 To clean pennies and make them shiny, try this process at Science Bob … learning experience and fun for the kiddos too! This whole project can be made in advance, just keep the finished cookies stored at room temperature in an air-tight container. 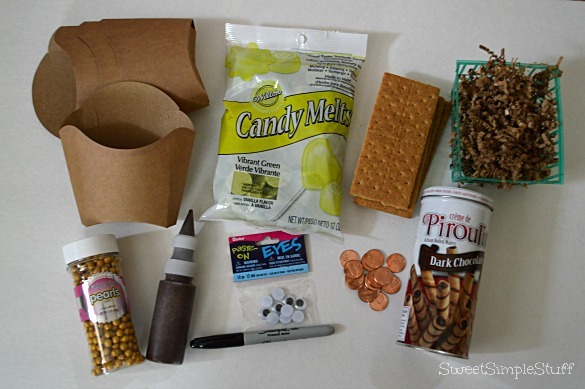 Use small dots of hot glue (one at a time) on the french fry box to attach 9 pennies, forming a beard. 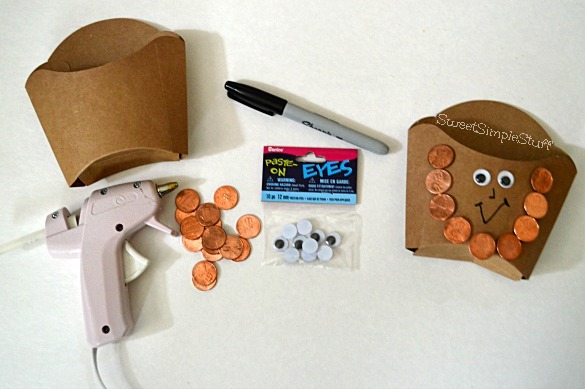 Use hot glue to attach 2 eyeballs and Sharpie to draw a nose and mouth! 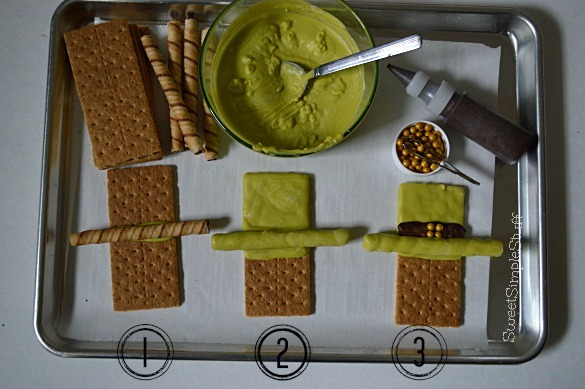 Melt candy according to package directions and use a small amount of green to attach a tube cookie at the middle line of a graham cracker, let candy firm up. Hold the cracker over the bowl of melted green candy and gently spoon candy over the top and brim of the hat (I didn’t even cover most of the back of the cracker), drag across edge of bowl to remove excess candy. Chill for a few minutes. Use dark chocolate to draw a ribbon (about 1/2″ to 3/4″ wide) and place 4 gold pearls in the center, forming a square (I used tweezers). Chill until set. Place finished cookie in completed french fry box and use crinkled paper to hold the cookie in place, leaving some poking out to look like hair! 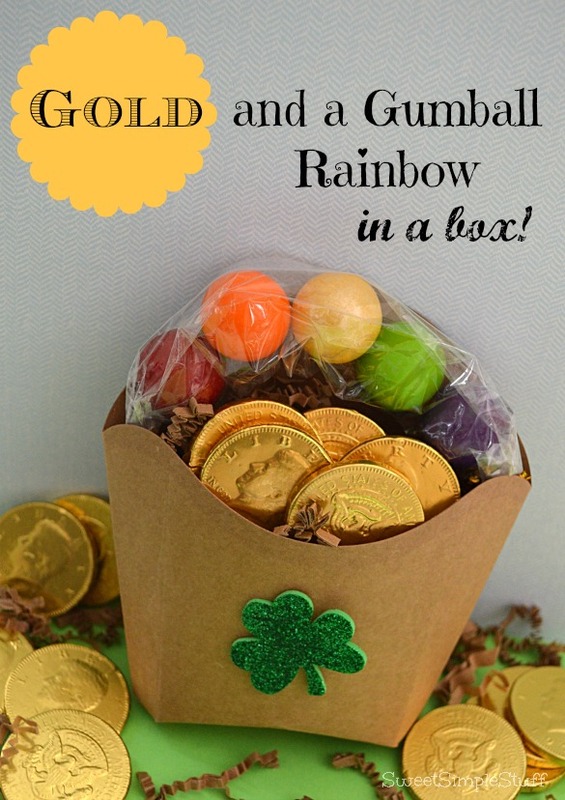 Gold and a Gumball Rainbow in a box! Are you feelin’ Lucky today??? What a fun idea. I’d like a beard made of money!!! Them are Absolutely Adorable and how very clever.